Someone Please Cut Me Off! 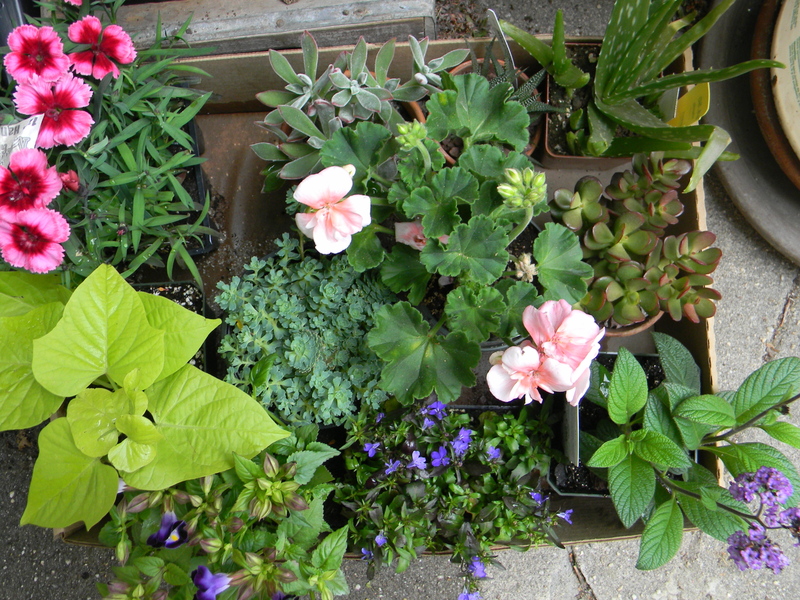 It’s a fact: I should no longer be permitted to attend any plant sale, anywhere, for a long, long time. Clearly, I can’t be trusted. I’m normally pretty darn good about budgeting, saving and spending. My question is this: WHAT HAPPENED??? 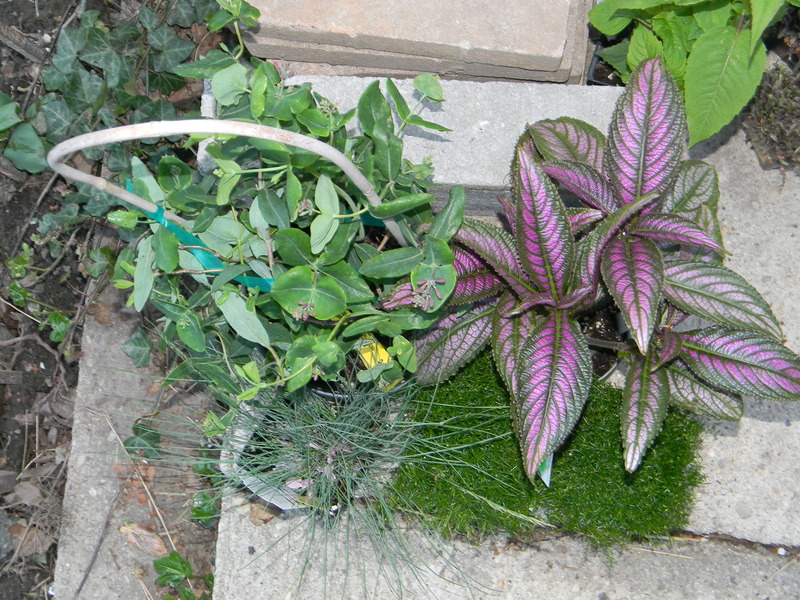 True confessions: the first clue that I was in over my head was when I spent pretty much every penny that I had set aside to buy a bicycle…and spent it on plants. Troubling, yes, but sadly I did not even stop there. After hitting the Brooklyn Botanic Garden plant sale (where the man who rang me up asked me: a] if I was married and b] whether I though my husband would divorce me after this!! 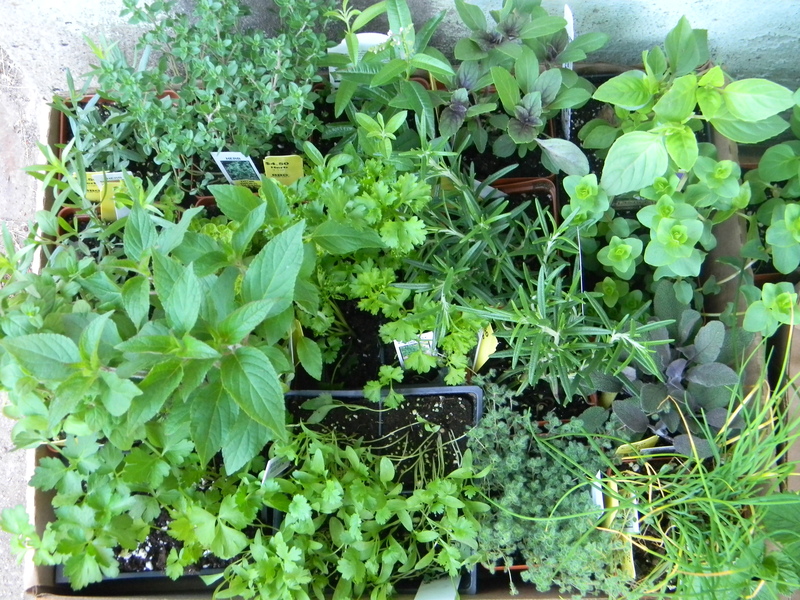 ), I proceeded to go, just 5 days later, to the Community Garden Plant sale (where I knew I could get a good deal). 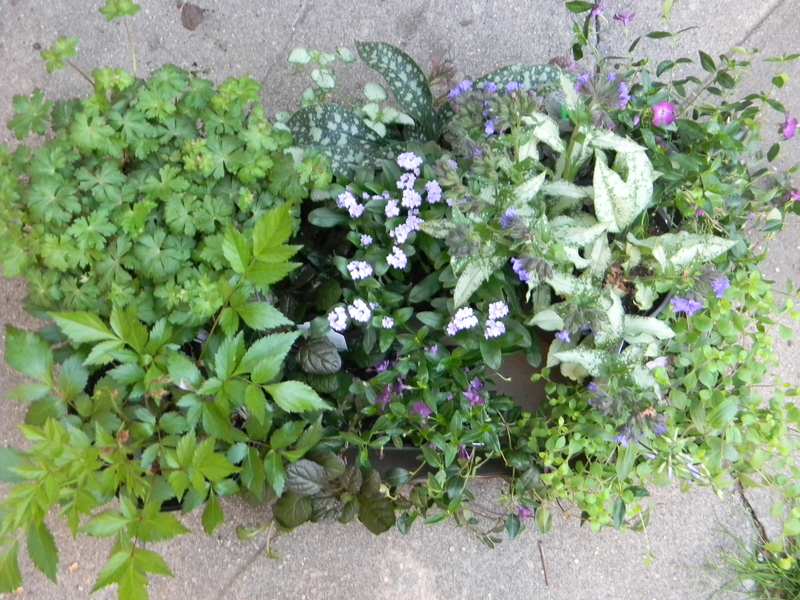 Finally, last week I stopped at a hardware store to innocently buy another watering can…and left with…yes, PLANTS. Sigh. When I confessed this to a friend of mine she stared in disbelief and said “how the heck did this happen?” Good question. My only defense is that I have literally been standing in a 3rd story kitchen for the past five years staring out at the empty backyard below and dreaming about what I would do with it if it were mine to plant. Now that I finally have a place, I guess I went a *little* overboard. 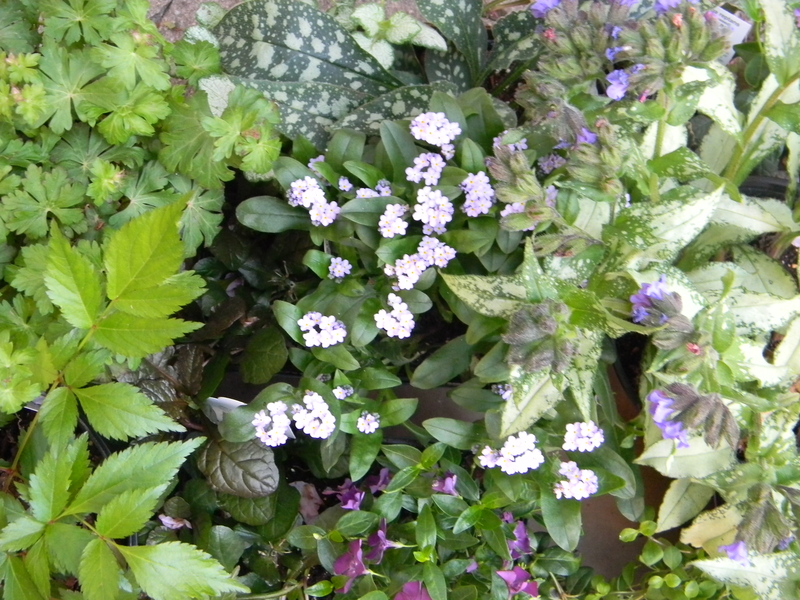 In my joyful state of denial and abandon, I willingly ignored warnings from people like my friend Bev who told me “don’t try to create it all at once…do a little at a time” and also had the great suggestion to buy a (as in one ONE) plant (in bloom) per-month…”this way you won’t spend too much and there will always be something blooming in your garden.” Brilliant! Great idea. It’s hard not to be frustrated with myself at this complete lack of self control which might very well result in me not having a bike…or having to take the money saved for something else in order to get one. 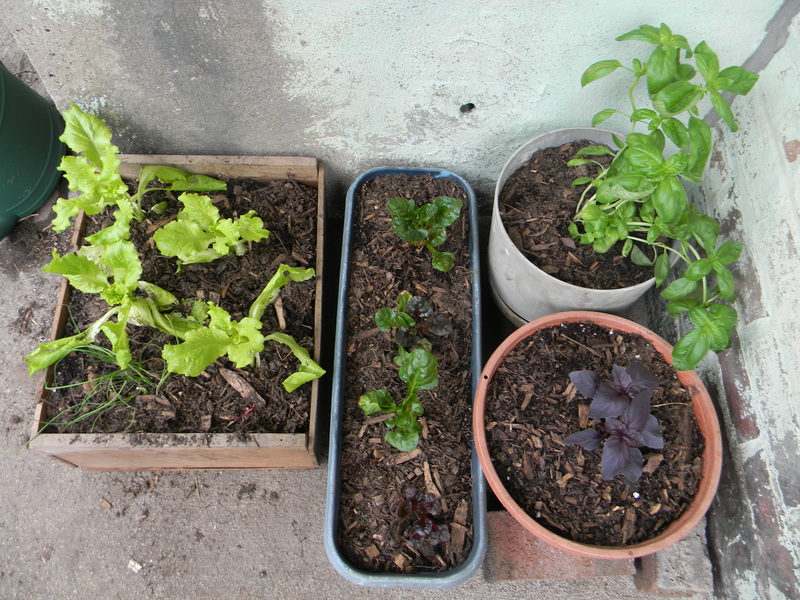 Still, I’m so happy with my plants and my garden and every moment is so thrilling that it’s hard to be upset! I’m REALLY hoping that this was the Big Kahuna of plant purchases and that from here on out it will be a small purchases here or there, some bulbs, some divisions traded with other gardeners, etc…there really isn’t room for much else at this point! 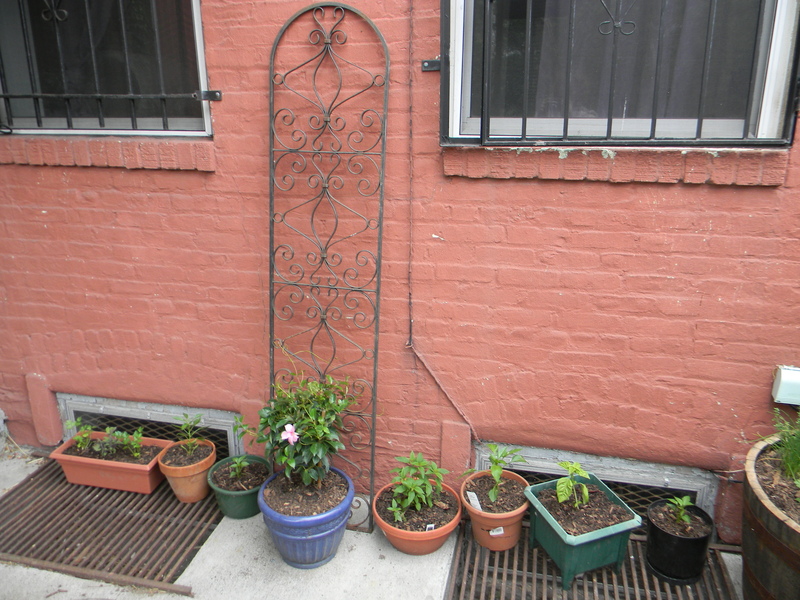 herbs, peppers, and pink Mandevilla, which I’m hoping will climb that iron trellis. 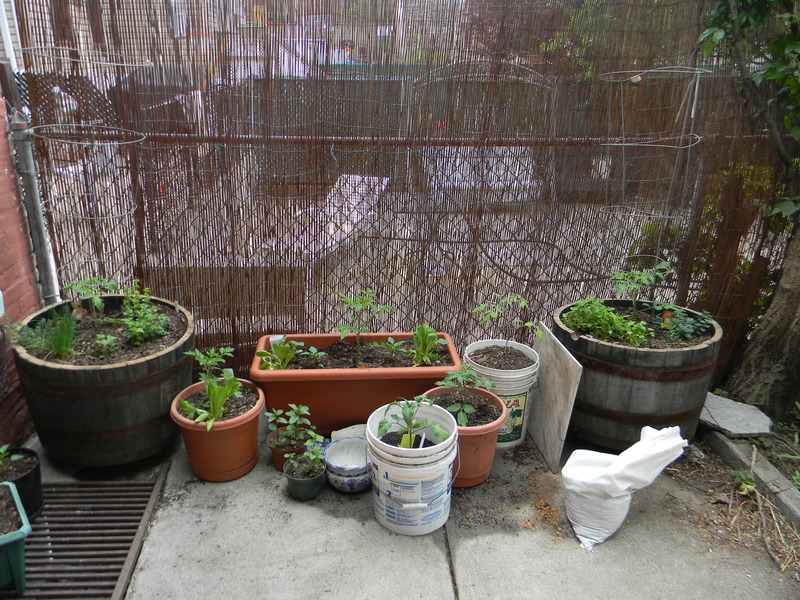 the temporary tomato collection…the big things are all on wheels should they need an even sunnier spot, but so far they are doing well here. I need to get more cages on pronto and will eventually have to move some of the smaller tomato pots elsewhere so that they’ll all have enough room. What was I thinking? 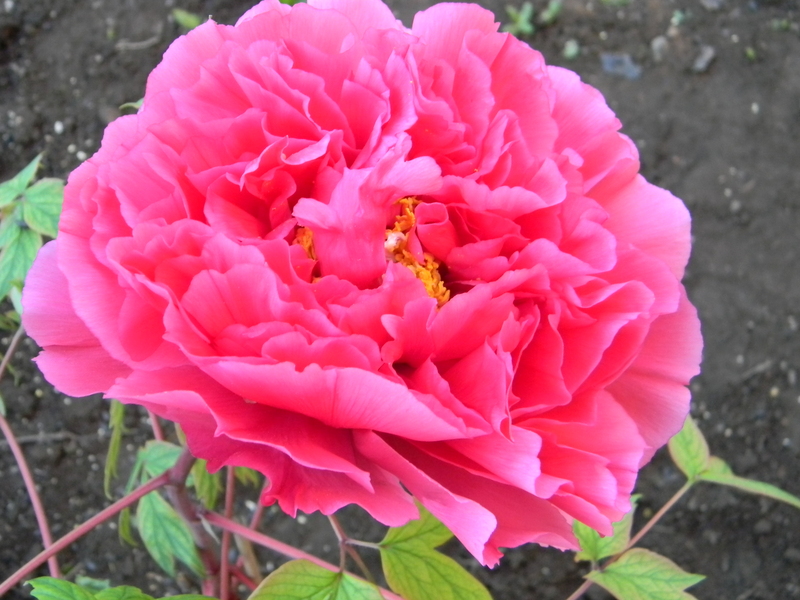 After doing some research last fall I discovered that – lo and behold – tree peonies (which I’d never heard of before) can tolerate a healthy serving of shade! 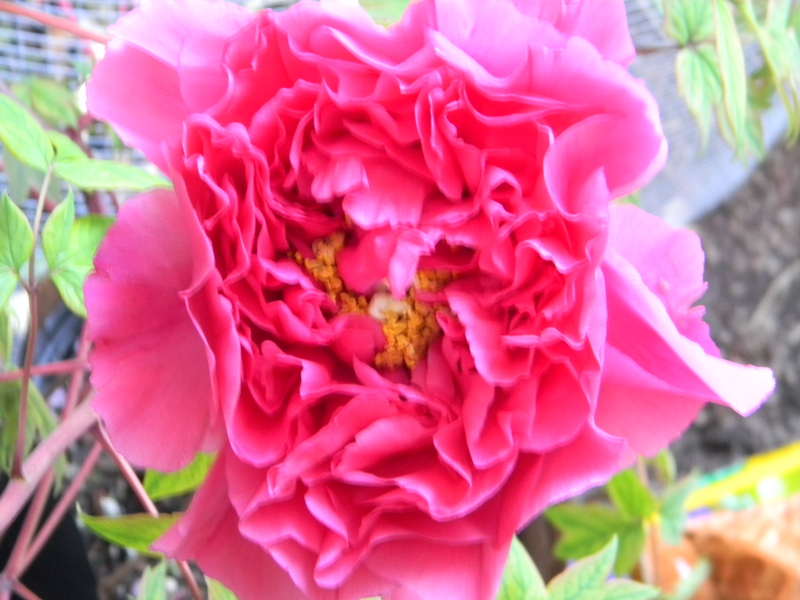 I think I prefer herbaceous peonies, but I’ve come to really appreciate the tree peonies that I have seen and hey – I’m grateful to have a variety that can live in our yard! 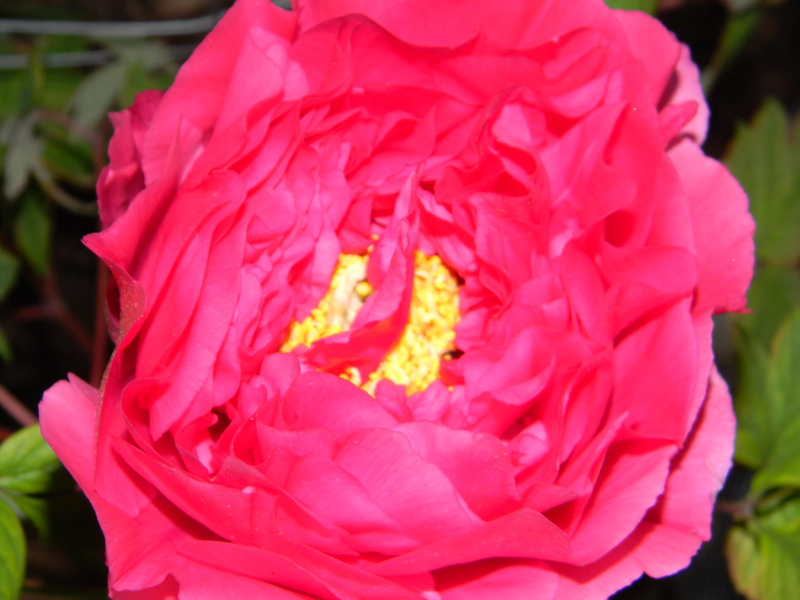 So, I splurged on a tree peony at the Brooklyn Botanic Garden Annual Member Plant Sale earlier this month. The information on the container it came in didn’t seem to be correct (totally different color), so I don’t have the specific variety name, unfortunately. 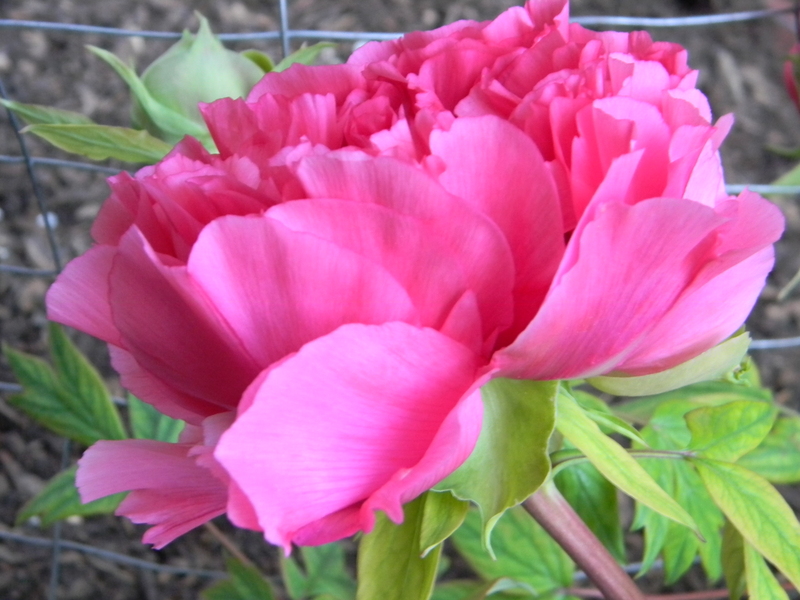 The volunteer staff on hand didn’t know either, so I guess the peony falls into my mystery category. It’s either Chinese or Japanese, and it’s definitely at least a few years old. It was blooming and I expressed my concern about transplanting it while in bloom, but I was assured by a BBG staff member that she transplanted hers when it was in bloom and it was just fine. (Let’s hope she’s right.) 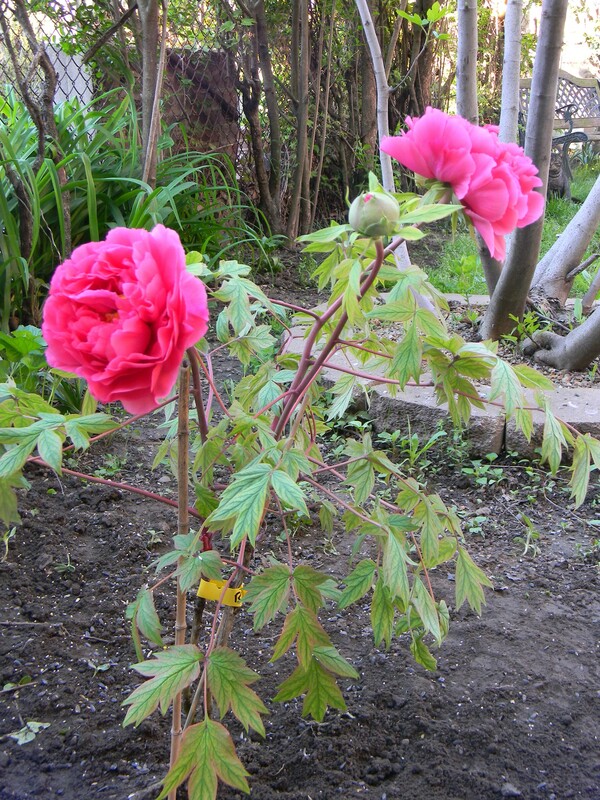 She said she has three tree peonies and that she gets mostly shade and they are all happy. Wow. Evidently “bright indirect light” works for them. The one I chose is a real show-stopper and a total departure from my usual calm, cool blues and purples or the soft, romantic creams and light pinks that I usually prefer. This color really packs some serious punch! 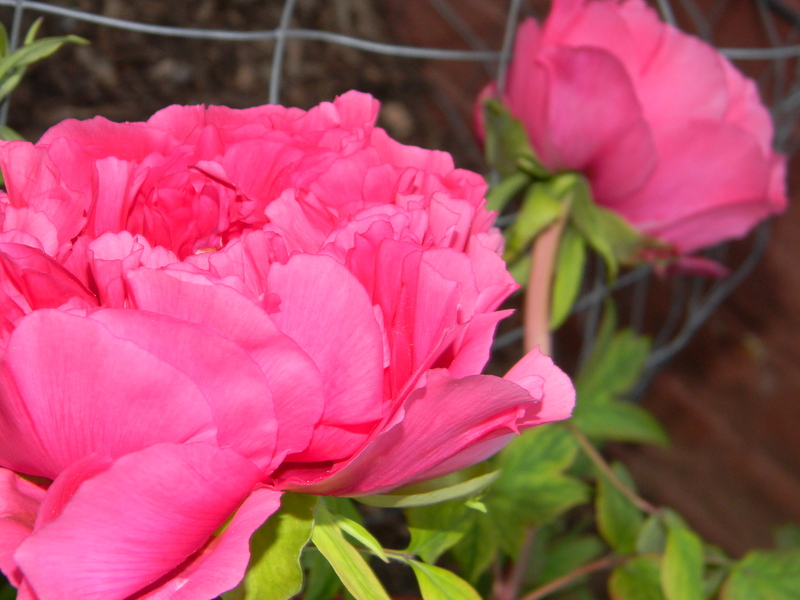 I’m hoping the round peony support stake I just ordered will arrive SOON – those heads are heavy! I know it will only bloom for a couple of weeks each spring, but wow…it sure makes a statement while it does! I was in a hurry to take pictures – this one’s a little fuzzy – shoot. Here it is after being transplanted into its new home. 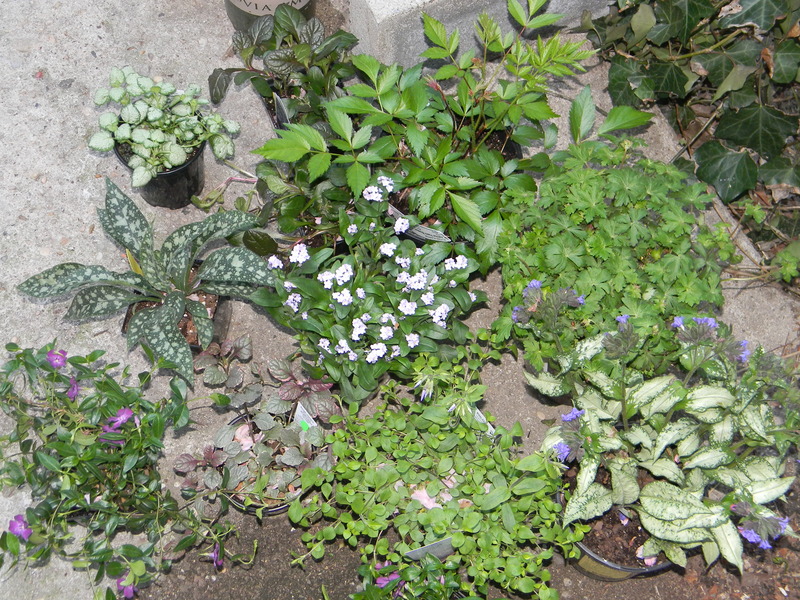 I’m hoping it will be happy here, have enough sun, shade, room, etc. There are other places I could move it too if doesn’t seem to like this spot, but I’m very reluctant to do so after having just transplanted it here. I’d like to wait until at least next year and see how it fares. 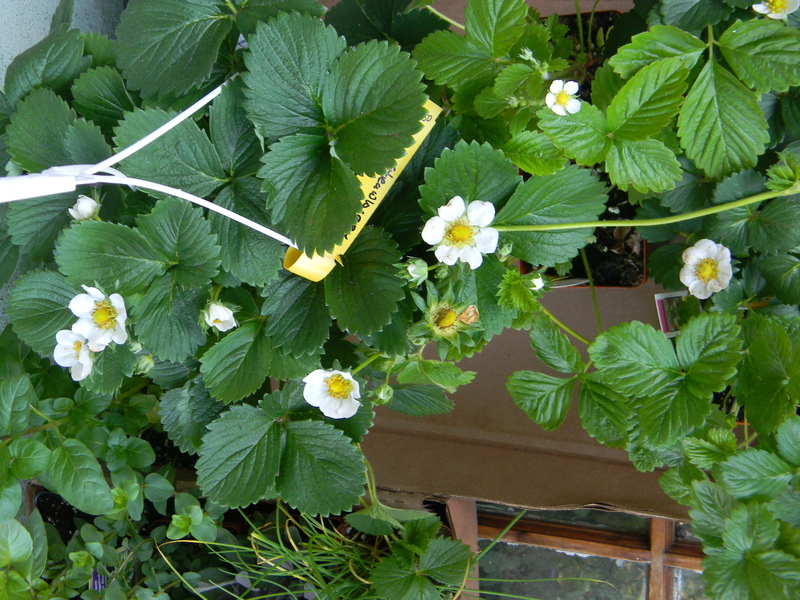 The flower petals are now all falling off and the plant looks a little “wilty” over all. I am resisting temptation to give it too much water, as I’ve read that they do not like wet feet. I’m just going to take it day by day and see what happens, but I’m sure hoping this one will make it!